Today, the Internet commands so much attention that it is easy to forget about pre-established channels of media that are mixed up within its melting pot: radio and television. Although not a purely direct line, we would not have our most recent form(s) of communicative technology without having built upon these previous two. Other than this, why look at these older media now? To learn a bit about their past, to see how the jump was made from one to another, to investigate the public attitudes and educational approaches to them, and to seek a greater understanding of why and how we interact with media in the ways we do today. Prior to the introduction of radio to the public, people received most information by spoken word, written word, musical recordings, or telegraph. Most information was passed on asynchronously, and texts (music, newspaper, books, etc.) were usually used by individuals or, perhaps, small social or family groups. Many people were excluded from the use of certain texts for reasons such as race, financial means, or literacy rates. With radio came the opportunity for people of any location, race, literacy level, and almost any financial background to share the same experience as many others across a wide space at the same time. Sometimes, the news might even be live, from primary or first-hand sources. For some places, take Canada for example, the exposure to the music, issues, and ideas of other regions brought understanding, a new sense of national identity, as well as national icons, especially in sports and music (Fitton, et al., 2006). Similar values became shared among a far-flung and wide range of listeners as they listened. We went from villages and regions to national villages, to, eventually, McLuhan’s global village. Not everyone was on board, however. There was some friction and anxiety about radio’s power – not just the fact some people reported they heard things with their dental fillings – newspapers were worried, and, for a time, were able to have restrictions put into place that limited how much news radio could broadcast. Eventually, those restrictions were lifted (Godfrey, 1998). Not long after, television came into play. 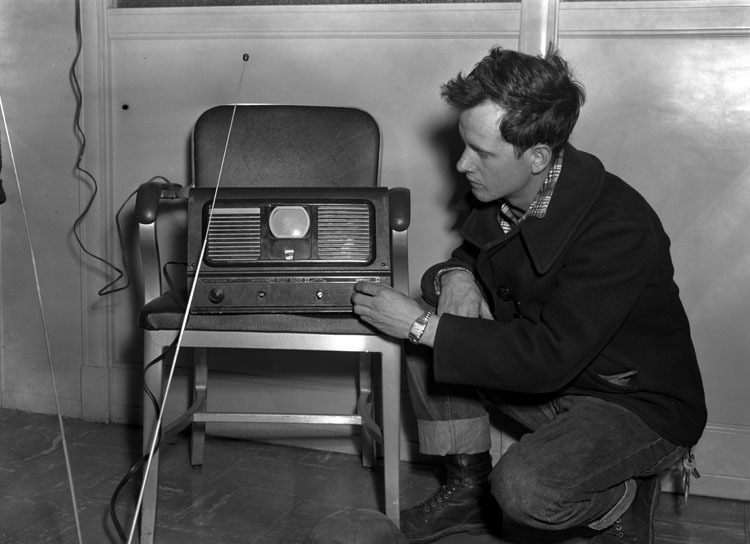 When this new medium arrived, its programming mirrored much of what was on radio, including the news, allowing viewers to see shows they were familiar with. Unfortunately for radio, now that people could both see and hear the news on TV, listeners left. This caused the amount of news and information / talk radio to be reduced. From that point, radio’s time slots became filled mostly with music. In terms of spread, or the rate of adoption of use, the common statistics seen are the ones which compare how long it took certain technologies to reach 50 million users (radio took 38 years, TV 13, the Internet four) (We the Peoples, 2000). What this does not account for is the change in population over time. To reach a saturation point in the market of 75% (the percentage of the population having bought / adopted the technology), it took 81 years for the telephone, 19 years for TV, 35 years for the computer, and 25 years for the Internet (DeGusta, 2012). This may be a more fair measure of how important, accepted, and widely-used a technology is for its time, vs. others. It surely does not take into account things like infrastructure and conditions for a technology’s success, but it seems as if TV was the most desired technology that was taken up by people fastest. When we read or hear the term “literacy”, the default meaning that comes into our minds is that it relates to being literate, or being able to read and write words. I would argue that one of the main things both radio, TV, and all technologies after have done is to change what our notion of a text can be, and what being literate means. Before writing existed, the kin to literacy must have been something like “listenacy” – the ability of others to listen and take in information. Once writing and symbols began to come into play, to be literate meant you had a command of your native language – you could read and write in it. Many years later, if you could read a book or a newspaper and write a letter, you were pretty literate. It may have been a little lonely, doing most of this on your own, and in your own mind, but at least you were literate. When radio came, there was a bit of remediation at play – written text, music, and spoken word were co-mingling and finding their ground with one another, and listeners had to adjust. Now, text could be an audible radio show, too, with sound effects. It could even be a hoax show, like War of the Worlds – teaching many the value of critical literacy / thinking. Listening to radio was often a shared activity as well, bringing an element of immediate community or sociality back to literacy. With television came less imagination – in the moment, at least. People no longer had to visualize what they were listening to – they could see it and hear it at the same time, helping to get more meaning out of the spoken content, since much of the meaning in speech is visual. While watching TV is a bit more passive for the mind than listening to radio, I would argue that it augments imagination, in a sense – or at least visualization or visual literacy – it would allow people to see and better understand more people, places, and objects. It would give them reference points in their mind of real things rather than leaving their mind to simply make up their own images. As much as radio was augmented text, TV (and movies, before it) upped it even more, combining visuals, and a wider array of effects with the message being delivered – creating people with an audio-visual literacy. For that moment, however, users of both radio and television still interacted with it in a very “oral” way, in that once the moment or show had passed, that was it – there was no way to save or reverse content. At the same time, both radio and TV were acting as models of the written word. Users were exposed to different styles and formats for writing (as well as speaking), and looked to certain shows or characters as examples of good work, inspiring many to try something similar (Orson Welles, n.d.). Neither radio nor TV are inherently bad, educationally. Both have track records that show deleterious effects – especially when they displace a valuable intellectual or social activity (Neuman, 1988), or when young children watch less intellectual shows (Wright et al., 2001). Both also have data backing up their educational benefits – how watching quality programming between the ages of two and three improves the school-readiness of children from low-income families (Wright et al., 2001), and that interactive radio instruction has been a success in some areas for decades, and continues to be (Bosch, 1997). Susan B Neuman summed it up well when she said, “The responsibility and the challenge of using television to expand children’s learning and literacy, however, lies not in the technology, but in our hands.” (1991). It’s not a technological problem, it’s how we do or don’t use it. Language, literacy, and education are dynamic entities, and radio and television are “merely” a couple of important technologies that have had an impact on all three along the way. For millennia, many have warned (Plato, included) that writing and a departure from oral language will damage the memory of those who use it. If what Silcox said in 1993 is true, that we remember 10% of what we hear, 26% of what we see, and 50% of what we see and hear, how can that be true? Is it not also ironic that we may read a once-oral story from Plato from 2,372 years ago, warning of writing-induced mental failure… remembered en masse because it was written down? Perhaps we remember some or more things really well in oral situations, but not nearly so many things overall. Silcox also noted that we remember 90% of what we do. If this is also true, modern media, which allows for more interaction (natural, and associative, at that, according to Bolter) should be the best version we have yet. Through technological remediation or negotiation, the Internet still has radio and TV in it – both are robust, useful, and still have their place. Whatever the next seemingly large shift is from where we are at, we might do well to welcome it (with a critical mind, still, of course) and further ourselves a little faster. It seems the right approach to take in a global village which exists in secondary orality, and the young – the digital natives – are most likely to be the first ones down the path (Prensky, 2001). Bolter, J. D. (1991). Writing space: the computer, hypertext, and the history of writing. Hillsdale, N.J.: L. Erlbaum Associates. Bosch, A. 1997. Interactive radio instruction: Twenty‐three years of improving educational quality, Educational and Technology Notes Series, Vol. 1, No. 9. Fitton, A., Kenyon, R., MacDonald, R., & Parker, L. (2006). Canadian Identity. Toronto: Thomson Nelson. Godfrey, D. & Leigh, F. (1998). Historical Dictionary of American Radio. Greenwood Press, Westport. McLuhan, M. (1964). Understanding media; the extensions of man,. New York: McGraw-Hill. Neuman, S. B. (1988). The displacement effect: Assessing the relation between television viewing and reading performance. Reading Research Quarterly, 23, 414-440. Neuman, S. B. (1991). Literacy in the television age: the myth of the TV effect. Norwood, N.J.: Ablex. Silcox, Harry, A How-to Guide to Reflection: Adding Cognitive Learning to Community Service, Brighton Press, 1993. Wright, J. C., Huston, A. C., Murphy, K. C., St. Peters, M., Piñon, M., Scantlin, R. and Kotler, J. (2001). The relations of early television viewing to school readiness and vocabulary of children from low-income families: The early window project. Child Development, 72: 1347–1366. This entry was posted in Research Paper and tagged communication, culture, language, literacy, mcluhan, media, Ong, orality, technology. Bookmark the permalink.